This nocturnal and sundial is made up of three disks of varying diameter superimposed on top of each other. The centre is pierced by a hole, around which a long pointer is pivoted. The lower disk bears indications of the days, months and signs of the zodiac. The middle is divided into 24 hours and has a short pointer. The upper disk, the smallest in diameter, has 24 protruding teeth, and is subdivided into circles each of which has various markings. 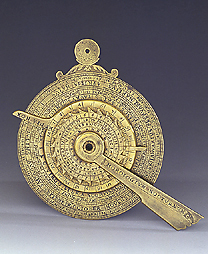 The back of the instrument bears a quadrant, divided into 90?, and the hour lines for a sundial. The nocturnal allows the time to be calculated during the night by using the polar star as a reference point. This dial, dated, signed and calibrated for a latitude of 43? 44', corresponding to Florence, is very similar to another, which originates from the Medici collections.